Incoming Southern Illinois University Edwardsville students are learning about sustainability as part of their Springboard to Success orientation. SIUE is hosting Springboard to Success orientation programs on campus. Incoming freshman students and their parents attend a two-day orientation and academic advisement event to help prepare them for a successful start of the academic year in the fall. 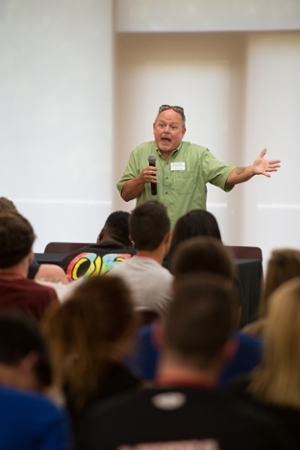 Frey Spurlock and SIUE Sustainability Officer Kevin Adkins spoke to approximately 400 incoming freshmen last week in two separate sessions. Springboard sessions will continue through July 1. SIUE will present a total of 10 meetings for incoming freshmen. To illustrate the University’s Bike Share Program, Adkins rode into the Morris University Center Conference Center, to the delight of the students. 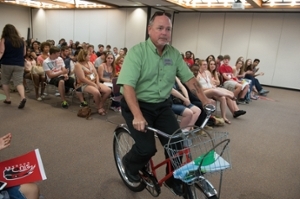 Kevin Adkins rides one of SIUE’s Bike Share bicycles in the Morris University Center Conference Center Room to emphasize a point of sustainability to incoming freshmen.